The weather is steadily turning more and more grim these days so I start to reach to the back of the wardrobe for the trusty old jumpers. They add bulk to keep you warm, but can ruin a silhouette and make you look lumpy. They can last for years, but take more TLC than I generally have the patience for. I have a mix of good real wool sweaters and cheaper acrylic versions. The cheaper ones are more trend-led, seasonal pieces that I wasn't prepared to invest a lot in, but the others are classic pieces in merino wool and will feature year after year. Keep a mix of fine and heavy sweaters for different occasions in the basic colours; navy, grey, claret or dark green. Throw in a couple of cardigans and you have a strong, versatile wardrobe. Never hang a jumper - always fold it. Your shoulders will be at your elbows otherwise. Wore your favourite jumper today? Resist the temptation to wear it tomorrow. Let it rest so the wool fibres can bounce back into shape. If it says dry clean, dry clean it. This doesn't mean after every wear though. These are possibly my favourite jumpers. They are both from Uniqlo, Merino & lambswool and under £20 each. I have to admit I committed the cardinal sin against wool with this pair though. Since I lost some weight, they became a little too baggy so I washed at a high temp to shrink them. They felted a little but nothing major and I get to keep some old favourites. 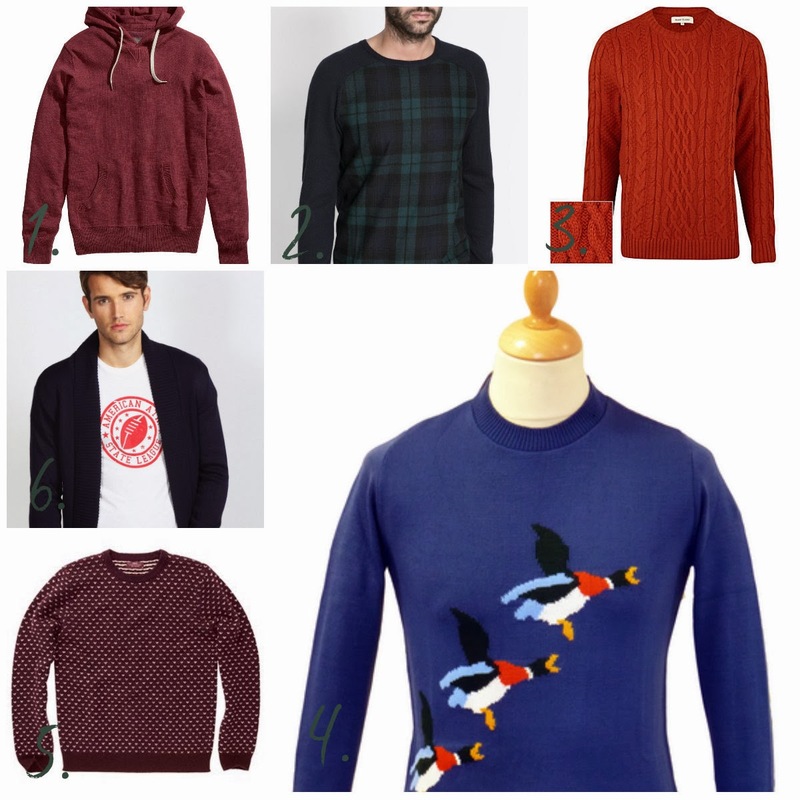 All crew neck which makes them a little more casual, they have contrasting chest, yoke or sleeve patterns. This is my newest addition and I love it. I usually avoid creams as I think they wash me out, but the anchor pattern made me think of aran sweater and winter warmth so I snapped it up for £15 in Primark. (I have heavily disputed claims it is a Christmas cardi). On the right is a denim blue cotton cardigan from Next. This light weight piece is great all year round for layering. As much as I love these little buggers, there is always that covetous voice in the back of my head telling me that I could really do with a few more options. So, on to the wish list! H&M Knitted hoodie £19.99 I'm a hoodie devote. This knitted one makes for something a little more interesting and will be a nice texture variation if you layered with a gilet. Zara Tartan sweater £29.99 Tartan is a big trend this season but if you didn't want to go the route of the usual red, this Campbell style with the plain raglan yoke is a nice alternative. River Island Rust cable knit jumper £35.00 You need a shot of style vitamin-c in your wardrobe this winter to stave off fashion flu. Atom Vintage Village Green jumper £29.99 A bit of retro fun - not all your clothes have to be sensible. Next Birdseye lambswool crew neck £35.00 I love the simple pattern on this jumper; perfect under a pea coat for a traipse round the market. Thick or thin, cardi or crew neck, you need a few jumpers to see you through autumn and winter (and probably most of spring too) Hopefully this selection has a few inspiring choices but I'd love to see what you are wearing this season.